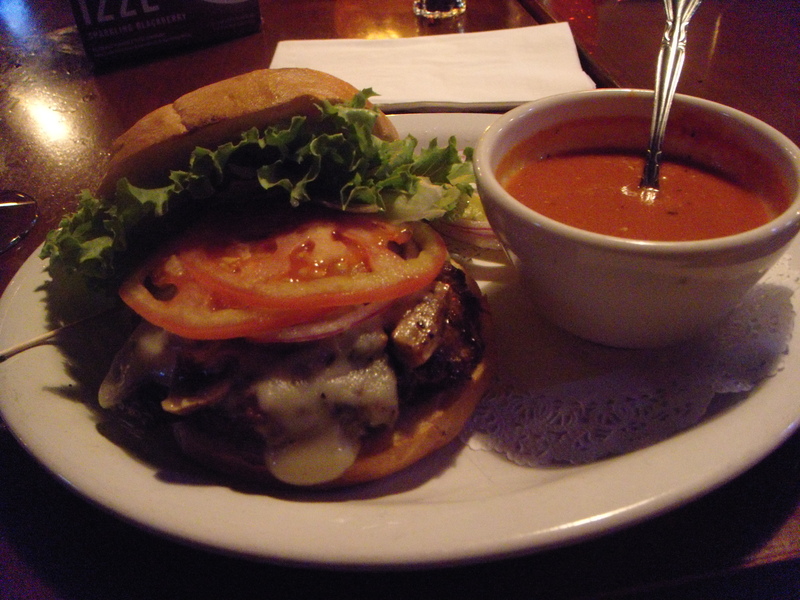 Mushroom Swiss burger and tomato, bleu cheese soup. Damn. Good. It’s Sunday night, and J and I are in different cities. With our schedules you’d think we’d be used to separation. But we are seldom apart on weekends. So I am thinking about weekends past, and one in particular: last weekend and our Saturday-night burger fest at The Mash Tun. Conveniently (and temptingly) located two blocks from our house, The Mash Tun is an Alberta Street brew pub with free pool, darts, a full bar and house-brewed suds. It’s the first restaurant we went to when we moved to the neighborhood, and is usually the first place we think of on nights that we’ve made the effort to get dressed, but can’t muster any more energy than that. Two giant brew kettles mark the entry on NE 22nd Ave and Alberta. Inside, the feel is casual and convivial with wood paneling, a central pool table and a jukebox that spins everything from 80s pop hits to downtempo jams. TVs hang in three corners for those with an eye on the game, and a pooch-friendly patio beckons in good weather. Most tables are filled with friends out for a casual night of conversation, pool, board games or tasty food. The menu lists a range of pub favorites — fried apps, sandwiches, mini-pizzas, salads and the like. In an attempt to mask this as anything but an indulgence, J and I typically start with the big, beautiful beet salad. The greens are fresh, the beets plentiful, a little goat cheese adds tang and hazelnuts crunch it up. After that, it’s on to the entrees, and we’ve tried a few: the bratwurst is one tasty, tangy dog with sauerkraut; the BLATO (bacon, lettuce, avocado, tomato, onion on sourdough) is a good bet, always. But, truth be told, we’re here for the burgers. Big beefy patties are juicy and flavorful enough to laugh in the face of the tabletop condiments — I go without. My top choice is mushroom Swiss. J switches it up, but last weekend, it was the bleu burger with bacon. (Specify your burger temperature when you order or you’ll get medium.) Fry fanatics, listen up: the frenchies here are hit and miss, and it breaks my heart. But too often they are tepid and mushy. I now avoid them in favor of crunchy tots. A handful of house-brewed beers on tap wet the whistle, but there’s a full bar if your whistle cries out for a cocktail. Sweetie, I miss you. I miss The Mash Tun. Here is to many more almost-lazy Saturday nights in our neighborhood haunt. I’m with you on the mushroom swiss burger… nothing beats it. BUT ….. a beet salad? did you mean to say beef salad? yes, maybe that’s it. beef salad. mmmmmm i’ll have a burger and beef salad on the side. sign us up for this place when we visit.